Buried in the long press release published last week by BMW around the 2010 Innovation Days, lays an important section on an interesting feature: Remote Controlled Parking. “While the Park Assist system in the new BMW 5 Series helps drivers during parallel parking, Remote Controlled Parking goes a step further, performing an entire parking manoeuvre – in this case forward perpendicular or garage parking – single-handedly. The driver does not even have to be sitting inside the vehicle. 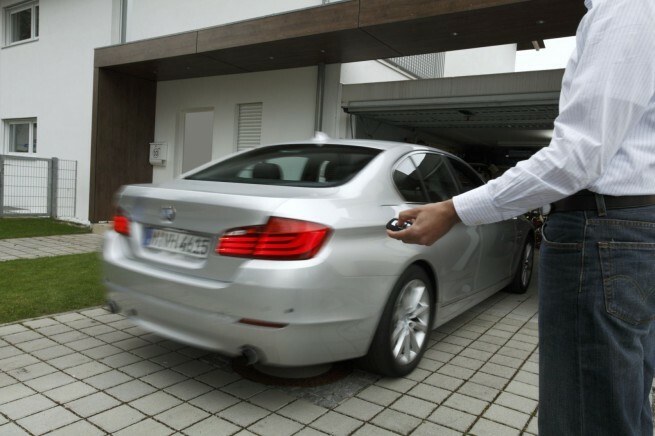 The Remote Controlled Parking function, also known as the “garage parker”, was first presented by the BMW Group in 2006, and the development engineers have been improving and refining it ever since. The new prototype of this system, which is capable of parking in any garage, even an unfamiliar one, without the aid of a reflector, demonstrates the progress made in developing near-production, automated driving functions. A driver planning to park in a narrow garage or other confined parking space using Remote Controlled Parking gets out of the vehicle and activates the automatic parking manoeuvre using the vehicle key. From this point on the garage parker takes control of the acceleration, braking and steering functions and manoeuvres the vehicle autonomously into the narrow garage – or out of it again. This spares the driver any awkward gymnastics or the risk of damage to the doors when getting into or out of the car in confined garages. Unlike the previous prototype, featuring a camera and reflector, the current prototype uses the vehicle‟s existing sensor systems. Guided by the six ultrasound sensors of the Park Distance Control and Park Assist systems, the vehicle slowly moves forward into the garage at a speed of approximately 2 km/h, aligning itself centrally between and parallel to the walls on either side. Any necessary steering corrections to achieve this positioning are performed by the power steering system motor. The garage parker‟s control unit also controls the engine Auto Start-Stop function, the automatic transmission‟s gear selector, and the brake system. If an obstruction is identified, the sensors order an automatic stop and the hazard warning lights come on to show the driver that the operation has had to be aborted. If, on the other hand, there is nothing in the vehicle‟s way, the system completes the parking manoeuvre, braking to a standstill and changing to selector position “P”, so that the vehicle is left properly secured. To activate the exit manoeuvre, the driver presses the same sequence of buttons used when parking. The vehicle will then autonomously back out of the garage or parking space. Again, the sensors monitor the area around the vehicle for any obstacles and again the driver must be standing close enough to the garage to be able to follow the entire operation.